Nightingale - There Are Inkspots On My Page! You can find this, and other reviews, on my blog. 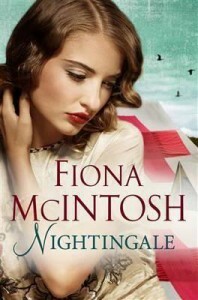 I’ve been a fan of Fiona McIntosh since she was writing fantasy, so the chance to review Nightingale was very exciting, despite it being a bit out of my comfort zone. Nightingale follows Claire Nightingale and Jamie Wren through WWI - from landing at Gallipoli where they first meet, to Egypt and the Western Front, and even some time in Istanbul after WWI as they both cling to a promise to meet again after the war. While it’s ultimately a historical romance novel (not my fave), it’s also a brilliant insight into the things people can survive and the strength needed to get through such an overwhelming experience. I adored Claire and Jamie right from the beginning. They’re both so warm and full of life, it’s impossible to not want the world for them. I also really liked the supporting cast, especially Eugenie Lester, who is an absolutely delightful older lady and I’m so happy she got to play as large a part as she did. Even if you don’t usually enjoy romantic novels, this book is a must for anyone who enjoys history and brilliant storytelling.